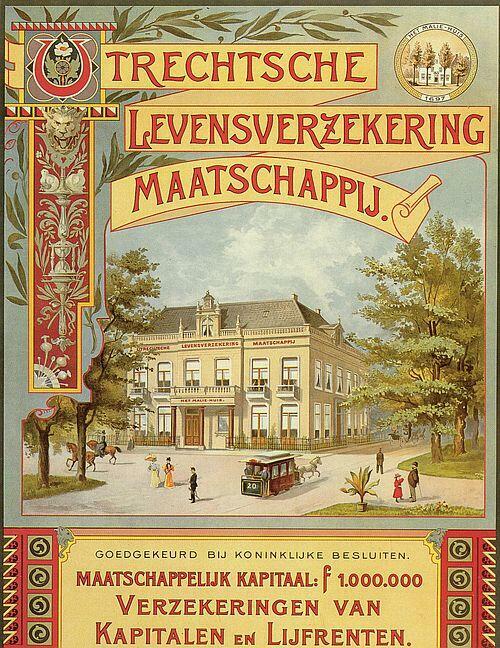 Zo Was Utrecht, a fantastic source for old images of Utrecht, recently Tweeted this old advertising poster that dates back to 1897. 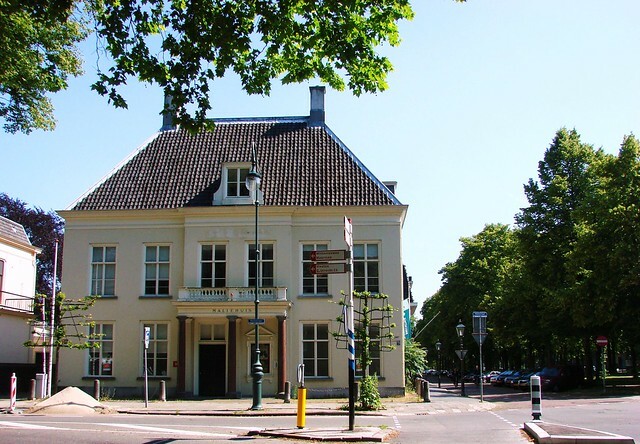 It’s for the Utrechtsche Levensverzekeringsmaatschappij (Utrecht Life Insurance Company/Society), which was housed at the time in the Maliehuis located at Maliesingel 28. 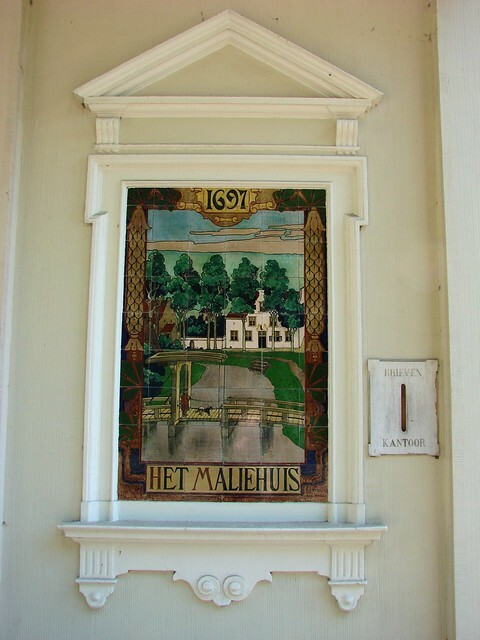 The original Maliehuis (huis=house) was built in 1637 and was used by the administrator of the Maliebaan. The Maliebaan, a long, tree-lined avenue, was originally used to play the game known as malie, which was somewhat like croquet or what eventually became golf. People could rent the game equipment from the administrator at the Maliehuis. This went on through the 18th century. Then, in the 19th century, the building was significantly enlarged and turned into a house. Eventually it then became office space, for businesses such as the aforementioned life insurance company, and nowadays, I think it’s used as an exhibition space. It’s a nice house from the outside, with clean, simple, classical lines. There’s also a tile depiction of the house, showing the canal that runs in front of it. That section of the canal is called the Maliesingel, but it is also part of the canal that rings the old city center. 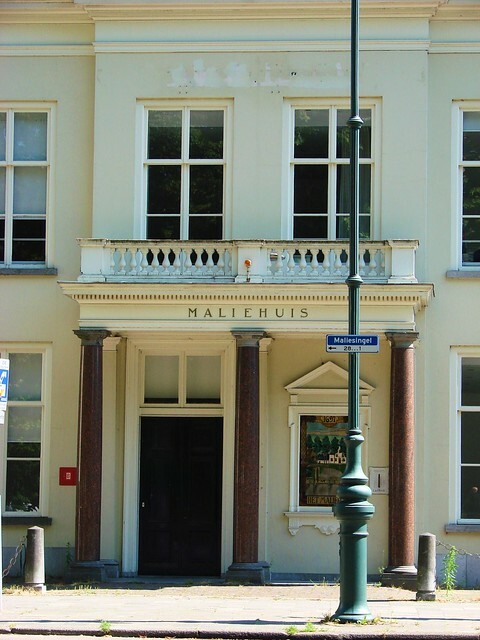 The Maliehuis is just outside the binnenstad (city center). My photos are a few years old, and I think the outside has been cleaned up since then. Still, you’ll see just how much the building still looks as it did in the illustration from the late 1800s. To the right is the Maliebaan, where the game was originally played. In the 1600s, it was a student area where they played malie and generally hung out together. It’s since changed to an important and wealthy area. 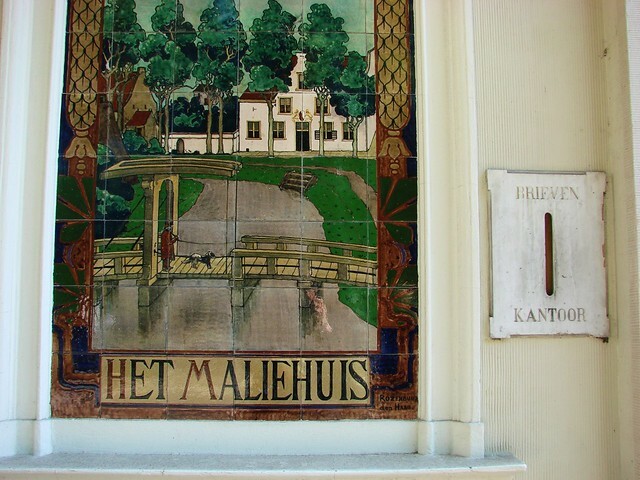 This entry was posted in architecture, canals, history, photos, points of interest, sports, time travel and tagged architecture, maliebaan, maliehuis, maliesingel 28, maliespel, old adverts, photography, sports, time travel, Utrecht history, Zo Was Utrecht by Alison. Bookmark the permalink. You are such a fountain of knowledge – I had NO idea that Malie was an old sport, even though the word is absolutely everywhere! The Maliehuis looks lovely – when I saw Malielaan on the map while looking for housing, I immediately dismissed it because in Den Haag we have this big, ugly, open field called Malieveld that is mostly used for protesters :p I’m off to take another look now! If you can afford the Maliebaan area here in Utrecht, go for it! It’s really beautiful. Definitely worth checking out. It’s also the spot where the first bicycle path in the Netherlands was created in the 1800s, I think. It’s also just a really nice area to walk, especially as there are some sculptures along the path. And I’ve learned something too, not knowing there was a Malieveld in Den Haag. I guess it was a pretty popular sport! Uau! Just loved this post! Maliebaan is one of my favourite biking routes to the city center. I never knew Malie was a game. And next time I’m going to have another good look to Maliehuis. Maliebaan is so lovely, it seems the obvious choice to create the first bike path there. Obviously, the appeal is still there! I had passed the Maliehuis plenty of times and never really noticed it, but the day I took the photos, it was such a beautiful sunny day making everything more interesting.